The global Left has an Israel problem. The global Left has a problem with Israel. 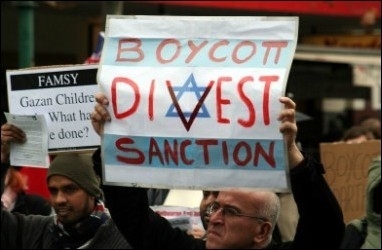 The "Israel Question" pervades the progressive movement, including the British Labour Party, Green Parties, liberal Protestant denominations, and a wing of the US Democratic Party – where supporters of the Boycott, Divestment and Sanctions (BDS) movement nearly rewrote the party's platform. Antipathy is dominant at universities, where endless boycott resolutions are introduced in student governments and "Apartheid Walls," die-ins and mock evictions of Jewish students are common. Within the classrooms, Israel is the Little Satan to the American Great Satan. Supporters of Israel find themselves under increased opprobrium and physical threat. "Intersectional" alignments between the BDS movement and Black Lives Matter, equating the Palestinian and American black experiences, threaten the vestiges of the black-Jewish alliance that underpinned the civil rights movement. Indeed, Israel is placed increasingly at the intersection of all forms of oppression. Some on the political and cultural Left, both inside and outside the Jewish community, have renewed efforts to sway the broader progressive movement back towards Israel with new organizations and new arguments. But is this goal possible? Is the global Left, or any form of leftism, inevitably anti-Semitic? Perhaps the issue is not simply that the BDS movement is morally reprehensible but that the premises of the global Left that facilitate and valorize it are wrong. There is little to debate about the liberal principles of individual liberty, gender equality, and religious pluralism. But it is in the implementation of such universals as equality and justice, opposition to racism and ethnocentrism, and cosmopolitanism and multicultural tolerance that the global Left has become unhinged. The necessarily political means of implementation have become objects of worship and are coupled with a ferocious will to power. The worship of means over ends is inherent to all efforts to reshape society, thought and behavior toward "justice." But the issue is not merely subjective interpretation or selective application of principles. It is, rather, a mindset particular to the Left that is both redemptive and retributive. Punishment is key to salvation, derived perversely from liberal values like justice and equality. But it is given shape and direction by Western guilt (i.e., secularized Christian guilt) and Third Worldism, which glorifies national liberation from the West. For some, this thinking is a means of willful cultural self-annihilation; for others, it is a path to personal redemption. Both are predicated on the seizing of all forms of power. This power-grab is rooted in several claims: 1) that oppression and victimhood are prime indicators of good and, conversely, of evil; 2) that nationalism is intrinsically bad except among subalterns; 3) that invocation of "human rights" demands uncritical genuflection; 4) that international organizations and NGOs are invariably correct and above reproach; 5) that "rights" are ever-expanding and never to be questioned; 6) that free speech is a dangerous aggression; 7) that academic inquiry, if not all intellectual activity, must be subordinated to the political; and 8) that all activity and thought must display the correct politics. Contesting ideas are evil and sinful and ought to be suppressed. These are the characteristics of the global Left in the 21st century, founded on the paradox of high cultural self-loathing made possible by capitalism. But they are also the characteristics of a political religion to which the global Left and the BDS movement subscribe. That religion sanctifies the Palestinians as it demonizes Israel, and, increasingly, Jews in general. Its adherents perceive themselves as an elect community, and they champion a totalitarian pedagogy. They believe, in the words of two leading scholars, in "[d]iscrimination against the outsider, undertaken by way of coercive measures that range from exile from public life to physical elimination of human beings who, because of their ideas, social conditions and ethnic background, are considered inevitable enemies." The religious dimensions of the global Left call into question secularization itself. Stripped of God, the movement appears nothing less than a new church, with clerics, theology, angels and demons. Do the Left's virulent hatreds and parochialisms, not least its hatred of Jews and Israel, thus flow precisely from leftist premises, in an inverse manner of the Right? A debate on this question is in order, but the terms have been skewed so far as to make debate almost impossible. All criticism is defined as Rightist if not reactionary. Thoughtful defenses of the nation-state as the best vessel to protect individual and minority group rights are derided as racist and exclusionary. Critiques of international organizations and NGOs as biased and unaccountable are seen as repression and censorship. The same applies to calls for objectivity in academia or even criticism of opposing ideas, which is now equated with McCarthyism. And any criticism, however mild, of Palestinian politics, society, or culture is automatically racist, a Zionist defense of "occupation." That Palestinian society as a whole regards the "occupation" as the 1948 post-war status quo is either ignored or, increasingly, embraced as correct. The Left has erased the middle ground. Critiques of BDS from the Left describe it as a misapplication of liberal principles, misinterpretations that treat Israel as a unique evil. But what if they are in fact the logical application of those principles? Counterarguments are made that Israel defends freedom of speech and religion, protects the rights of religious, ethnic, and gay minorities, and enforces (however imperfectly) gender equality. All are trumped by BDS claims that any positive statements about Israel are a heinous whitewashing of the unique evils of dispossession, occupation, imperialism, and settler-colonialism. Explanations regarding historical exigencies (including Palestinian political culture or civil society) are trumped by the absolute conviction that Palestinians have zero agency; they can only respond violently to endless provocations. A leftist pro-Israel response claims that ending the "occupation" will remove the cause and alleviate the effect. But in the Palestinians" view, the original sin is Israel's very existence. Moreover, what is a leftist pro-Israel response to claims that "Ohio is infested with Zionists" or that Zionists are responsible for college tuition increases? The leftist ideology of "resistance" is the source of these calumnies. If the existence of any "oppression," meaning grievance, disappointment or unhappiness ("micro-aggression"), is cause for permanent revolution, how could the complaints of Palestinians or anti-Semites notprovide endless fodder for the global Left? The global Left's theoretical convergence and practical alliance with two other closed systems, Communism and Islam, is thus explained. Each is supremacist, regarding itself as the inevitable outcome of epic struggle against adversaries who are not simply wrong but evil. Each has core doctrines regarding conflict that are immune to updating, and diffused clergies who compete for primacy only through extremism. And each has a unique (if convergent) antipathy towards Jews and Israel. Islam's antipathy is foundational in the Koran and hadith; Communism's flows directly from party founders and 19th century socialism. And for more than 60 years, Soviet anti-Semitism was marketed to the Muslim, Arab, and Third Worlds. It is no surprise that the global Left has openly adopted the stance of its patrons and progenitors, nor that the Global Muslim Brotherhood, through its many Western organs like Students for Justice in Palestine, helps drive BDS. BDS merges two prophetic 'truths' – Israel as embodiment of atavistic nationalism and as theological affront. For the Left, Israel embodies atavistic nationalism that must be transcended in order to purify the world. For Muslims, the existence of Israel is a theological affront and impediment to the perfect Islamic world promised by the prophet, a wound to Islam's heart. BDS thus merges two prophetic "truths." A decent Left would recognize that Israel is not the source of all the Middle East's problems, but this measured assessment has been overwhelmed by an anti-Semitic Left. And thus one arrives at the central question: is the global Left, or any form of Leftism, inevitably anti-Semitic? Rightist "blood and soil" premises taken to a "logical" extreme are anti-Semitic; Jews are permanent aliens, forces of disruption and disharmony. Conversely, Marx argued that Jews' liberation from their religion would be the first step in their liberation (and that of humanity itself) from capitalism. But the leveling of difference is inherent in all the Left's ideas. Is it really Jewish difference that is fundamentally unacceptable, the chimera that is simultaneously capitalist and socialist, tribal and cosmopolitan? Is Jewish sovereignty in the ancient Jewish homeland another difference that must be extinguished? Perhaps the objections are deeper – to Jewish survival as a group and ideology, when "history" indicates that it should be otherwise; to the misunderstood idea of Jews as "chosen" by God; or even to the notion of a single God, which in a sense defies the underpinnings of multiculturalism. The central objection, that the Jews' continued existence impedes progress to Paradise, is very old indeed. The BDS movement's indecency is that of the Left itself. It is intolerant, self-righteous, and ahistorical. It demands the politicization of everything in the name of its own narrow sense of morality, justice, and rights. It subverts every institution it touches, turning them into mechanisms for indoctrination. In the revolutionary world of the Left, institutions like universities, corporations, and the state would exist only as shells for conformity and official self-righteousness. Behind the mask of solidarity and equality is a church that preaches a gospel of salvation and damnation, forever scourging itself and its endless enemies. The alternative is not a rightist vision where nationalism is the highest virtue, but civility, derided today by both left and right. But the immediate prognosis is crisis rather than moderation. Universities are at risk of collapse under the weight of their own irrational politics. Also wavering is the European Union, which debates the finer points of labeling Israeli products while millions of migrants hammer at its flimsy walls and flimsier cultural convictions. The BDS movement and the global Left cheer this on while the decent Left grasps for answers. Perhaps there are none. Liberal notions of equality and justice have been weaponized against the culture that created them, as tools for "antiracism" and "multiculturalism." The once-tolerant Left has embraced intolerance, replacing inquiry with inquisition. Any philosophy that seeks to straighten mankind's crooked timber is destined to take this route eventually. Jews and Israel are perennial scapegoats. The final act is not yet played out, but a rethinking is in order, including a return to classical liberal principles – along with a recognition of the abuses inherent in efforts to perfect humanity.